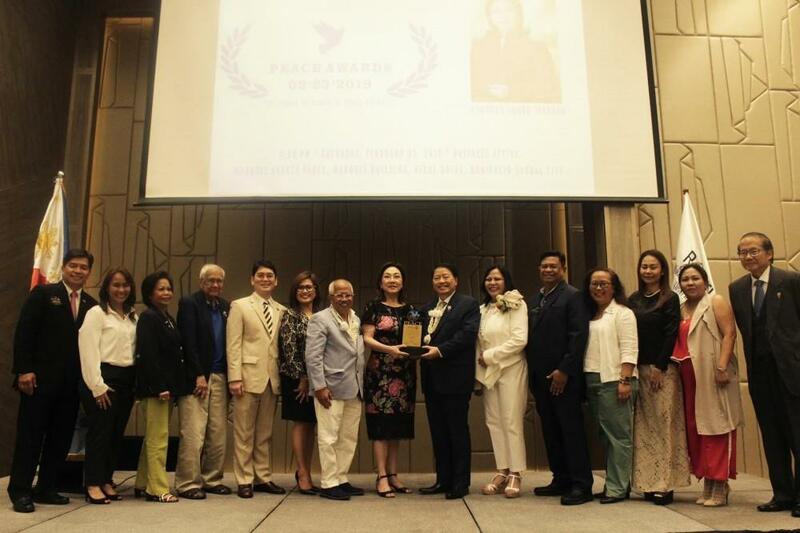 GMA News Pillar Mel C. Tiangco recently received the 2019 Rotary Annual Peace Award by the Rotary International District 3830, making her the first awardee among journalists. She was also given a Paul Harris Fellow recognition during the organization’s 114th Anniversary. During her stint as GMAKF’s Executive Vice President and COO for two decades, she conceptualized and implemented the foundation’s sustainable programs and projects where she led a team of passionate public servants. Instead of accepting her retirement in 2016, she continued to serve as GMAKF’s ambassador. “Hindi ko sukat akalain na ako ay magagawaran ng ganitong honor. Kung sasabihin nila na ako ay nakapaghandog ng sarili ko para sa kapayapaan ng ating bansa at ng ating mga kababayan, it is not the same as every other award that I have received,” Tiangco expressed. The Rotary Peace Award is given by the Rotary International to individuals who represent the ideals of peace, fellowship and world understanding. Some of the notable past recipients of the award were former Philippine Presidents Cory Aquino and Fidel Ramos.